This fabulously fuss-free fish fillet recipe I found in Leon’s (Restaurant in London) cookbook. The fillet is cooked fast at the highest temperature the oven can reach. How can this work without the fillet shriveling to a cinder? It takes ten minutes and the result is a delicious, succulent piece of fish with a modest “built-in” sauce. Served on a bed of spinach, swiss chard or a simple side salad of rocket, this is a useful company dish. Place an empty oven tray large enough for the number of fillets you are cooking on the top shelf. Heat the oven to the hottest temperature–yes, you’re heating the empty tray! Meanwhile wash and dry the fillets. Mix the oil and parsley together and turn the fillets in this mixture. Gingerly–as it’ll be very hot–take the tray out of the oven and place the fillets on it. Place the lemon slices on top of the fillets as in the photos. Put the tray back on top shelf of the oven for ten minutes–less if the fillets are relatively thin. When they are ready, serve them–suggesting diners press gently down on the hot lemon pieces. I’d never heard of ling, but just looked it up. It’s one of the Cod family, like hake and pollock, and I’ve developed a specific allergy to fish in famille Cod. I love sole, but the fillets I see are always very thin. 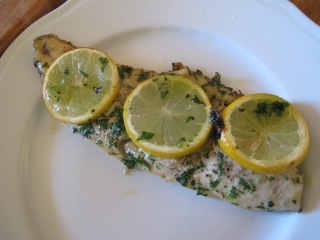 Can you suggest another white fish that might come in thick fillets? Thanks. The fish in the photo is trout. It worked well but needed less time–about seven minutes. I’m going to try salmon next. I should put the lemon on top of the fillets before putting the tray back in the oven, right? Thanks Tunnza–I left that out. I’ve rectified it now. Yes they act as a moist protection. Thanks, Robin!! My oven is 18 years old, and goes from 0-400 degrees F in 0-10 minutes on the Warm setting..This will be great, because I love all fish!! I was just diagnosed on 1/21 with type 2…We knew it was coming because I had gestational with both pregnancies, but I was able to stave off the Metformin and glucometer for 16 years with diet and exercise. My weight has always been an issue for me, and probably always will. I am 5 ft 4 inches short. When I get below 135 lbs, I look like I have three months to live… but the charts all say I should be 120lbs. Thank you for everything!! You’ve done so well keeping it at bay so long. Congratulations–it’s a devil! This looks amazing!! Thanks for sharing your recipies with us! Poldark again, and am enjoying as much as I did back in the 70’s! It can’t be that long ago! Again than you so much for sharing! I plan on ordering your cookbook asap!! All the Best! Can’t wait to try this – with Meyer lemons from our backyard tree. Thanks so much, Robin! Your recipes and photos are wonderful. You are lucky to have a Meyer tree–I have a chicken recipe with Meyers but no Meyers here in France. Robin….I have been cooking fish at high temp ro 10 to 12 min. depending upon thickness, but before cooking, I add lemon herb seasoning, or lemon juice, Italian crumb, butter dots, and perhaps a dose of white wine. Then bake and then turn on broiler to make crumb golden. it is the best! It took me many years to design this method of cooking fish. Husband loved it EW in NJ and formerly of FL. Floridians know how to cook!. Sounds delicious–I shall try it. As to other fish choices, what abut monkfish? Would that be a good candidate? Great new method for me, I love lemons on food also love all varieties of vinegar. I shall try it. Love all the comments you receive. They are helpful too. I have some orange roughy in the freezer that I will try this way. I’ve been trying to include more fish in my diet. Thanks for another wonderful recipe! Made it tonight with Tilapia – the fillets have a thin side and a thick side, so I overlapped the thin sides before I covered the fish w/lemons. 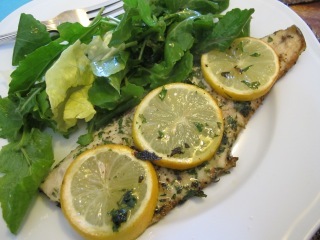 Tasted great – I liked it better than broiled Tilapia. Thanks Robin! Hi Melanie–overlapping’s a good idea. I bought a Tilapia at our local Asian store last week–frozen. First time for frozen and for Tilapia. I wanted to see how good or otherwise frozen fish was. I was doubtful. The Tilapia looked beautiful and defrosted well, but we both thought the taste was strange.